Travel is in the details. 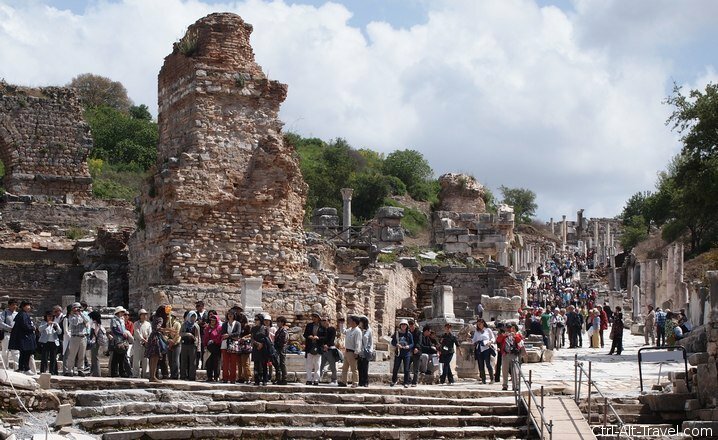 Ephesus is one of Turkey‘s grand sites. Central to it is the facade of the Celcus Library. This is the postcard image that is used across the country. For a lot of cruise visitors to Turkey along the Aegean coast, this is the only big site they might get to see of the country. So how did this fame live up when we actually went to sit under the arches? Pretty well in my opinion. This is definitely a site where we felt perfectly ok without a tour. 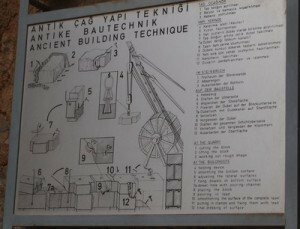 There are a few plaques describing how the library was once used, how it was constructed and how it was discovered again. So there was enough information to be had without a guide. The best part of not being bound to a guide was letting the crowds go by. 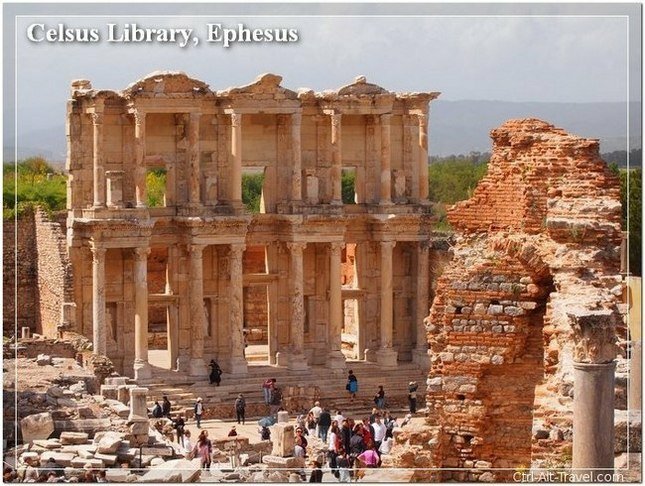 Ephesus is definitely a tour bus destination and the library is the central site, so it gets photographed to death by the writhing hordes of people. It is a really attractive building, so fair enough. However the guides keep their herds moving, so even if it is mobbed for a few minutes, they do move off. Without a guide we were able to sit on the steps and enjoy the relative calm. The facade is what you see pictures of. It is mostly intact (or rebuilt, I was never really sure). So the marble arches and steps which faced the courtyard felt historic. Inside is a bit more disappointing though. It had rained recently, so there were puddles about. That is perfectly fine, but it meant that it was harder to look around. While the outside is marble, the inner part of the building is brick. Whether this is authentic or not, it definitely was a drastic difference to the grand facade of the postcard visages. The facade has obvious doorways at upper levels, but the space beyond is barely one story high, so that as well needs to be filled in by the imagination. In fact the inside was so unimpressive that I don’t even have pictures of it. The facade is really what is impressive. Without a roof or any shelving, you definitely need to use your imagination at full power to see this as a library. Especially if the library was the low concrete and brick block in a strip mall like I had as a kid. Easier to imagine are the more styled buildings on college campuses. And yet this still feels different. The building is very obviously not a house and must have served some sort of public function even if you cannot see it as a library. It is central to town on the main street and right next to the main market. According to the plaques the books of the time were scrolls and were stacked in wooden cubbyholes which lined the inside of the building. So it was less of a library for studying and more a place to keep knowledge safe from the elements. 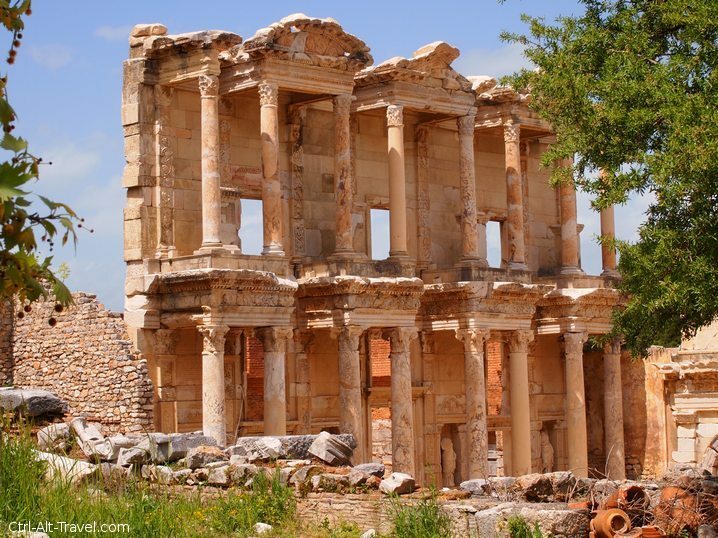 The library sits in the middle of a set of ruins and certainly fits in place. The facade is a shape and a reminder of what once was. A lot of the finer edges are crumbling with age, but there are still details to be seen. Sitting on the steps we noticed a early christian fish cut into the steps. 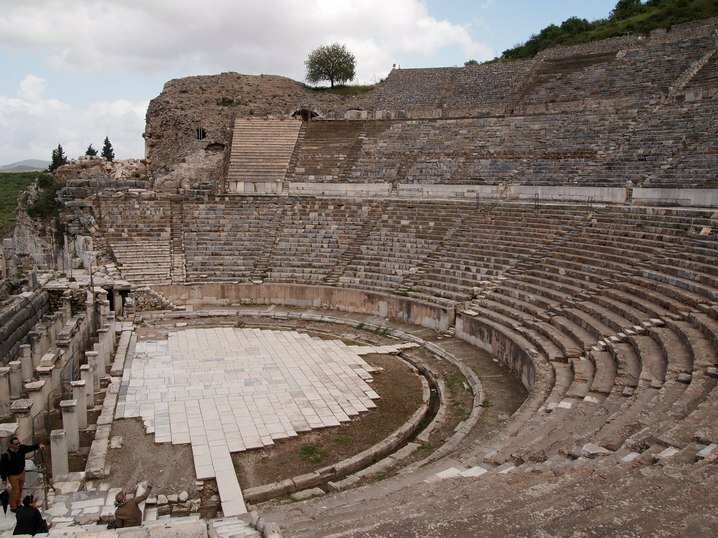 Ephesus has quite a few mentions in the bible, so that was quite cool to see. 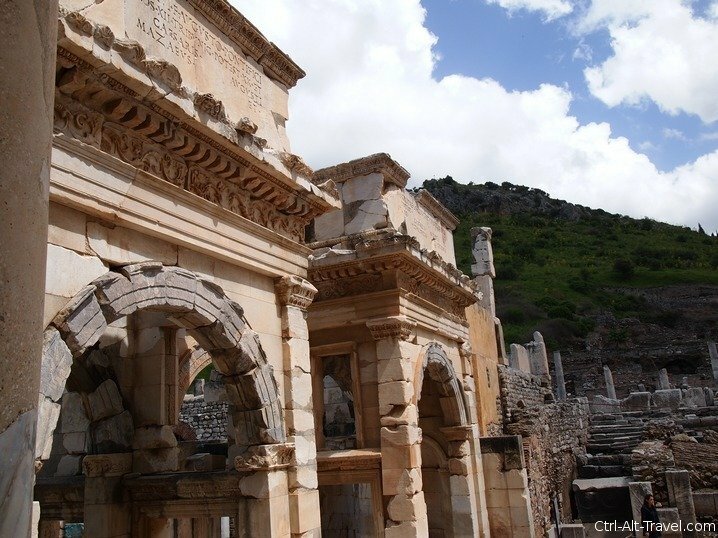 Nearby archways are inscribed with names of roman emperors and their wives who gave them as gifts to the city. There is history in the details. Statuary and intricate carvings around the columns are there as well. It is not just the recognizable tiered form if you look closer. There is a lot of detail on the building and the courtyard. It is worth exploring even that tiny area to try to imagine what it might have been like. 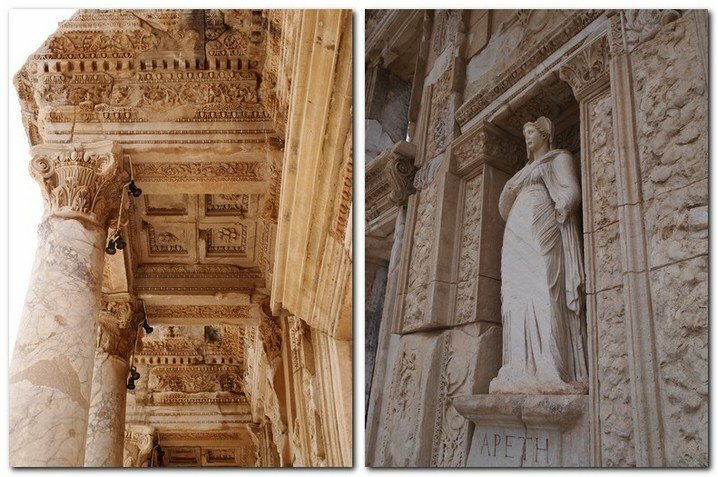 The Celcus library was rightfully the highlight of the visit to Ephesus for me. I quite enjoyed hunting around the details which have survived thousands of years. It takes a fair chunk of imagination to see it as a functioning storage of knowledge, but it is enjoyable regardless. One thing that I am so happy about is that it really is as big and grand as it seems in pictures when you are standing there in real life.